“Oil-flooded screw compressors are great for low suction pressure applications!” This statement is very much true and screw compressors have found many applications within the Oil and Gas Industry. However, their advantage over other forms of compression can become a detriment in some low pressure applications. Why are screw compressors so good for low pressure applications? During compression, oil is introduced into the gas stream. The oil is introduced for many purposes: to clean and lubricate the bearings; to clean, lubricate and help seal the rotors. Beyond these reasons, it is also injected to absorb the heat of compression. This permits many ratios of compression to be achieved in a single stage. A typical design for a screw compressor in natural gas compression will be for 5 to 15 ratios with a design discharge temperature of between 200°F and 220°F (93°C and 105°C). In these applications, a single stage of compression with a screw compressor can replace 2 or 3 stages of compression with a reciprocating compressor. Hot inlet gas from a source that will be water saturated, i.e. a well-head, treater, battery, tank, etc., will carry a larger percentage of water than it would at a lower temperature, thereby increasing the discharge dew point temperature of gas. As the mole weight of a hydrocarbon gas increases, the discharge hydrocarbon dew point temperature increases. Gases with a high percentage of C3+ should be looked at. H2S on its own is not a concern for condensation. However, with the presence of water in the gas stream, any concentration of H2S creates concerns around condensation and the formation of acids. 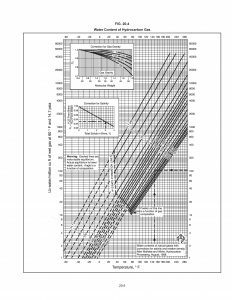 Referring to the water solubility graph below (Figure 1) from GPSA, we can see that at 14.7 psia and 60°F, a saturated gas will carry ~800 lbs. water / mmscf of gas. Keeping the pressure constant and increasing the temperature to 90°F, the same gas will hold ~2,000 lbs. water / mmscf of gas. 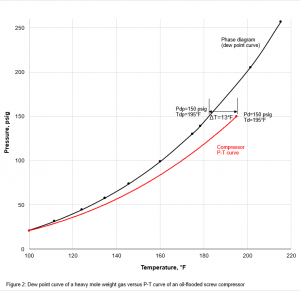 In Figure 2, below, we see a representative dew point curve of a heavy mole weight gas. The red line represents a typical pressure/temperature curve of an oil-flooded screw compressor. In this example, the gas starts out 100% water saturated at about 105°F and 7 psig at suction. It is then compressed to 150 psig with a compressor discharge temperature of 195°F. At this point, the gas has only 13°F of super heat which is well below the 40°F recommended super heat. Running at these conditions, water would likely condense on the walls of the oil separator and associated piping systems, contaminating the oil. If you have, or are considering, an oil-flooded screw compressor package in/for a high dew point temperature application, please contact the Compass Sales team for packaging recommendations. 1-855-262-2487.